When it comes to domain name registration, there is no such thing as a free lunch. That said, there are ways to get a domain name without having to pay. Sound like an oxymoron? Almost. Many companies will give you a free domain name, as they profit from you indirectly. For example, web hosting companies like Bluehost give away free domain names to customers who host their websites with them. The cost of the domain name is then recouped from the hosting fee. Other companies will offer a free domain name in return for displaying adverts on your site. Others will do it as a way to gather personal information that they can then sell on to advertisers. The latter methods are not worthwhile, in my opinion. The $10/year saving you make will cost you much more in the long run. The former method, however, is one that I use for virtually every website I setup. Web hosting is something that you will inevitably have to pay for when building a website. While there are a handful of free web hosting companies out there, they really… really should be avoided. We’ve talked about the benefits of using a good web hosting service in great detail before. In a gist, good hosting will make it easier to grow your website, provide a good user experience, and prevent a lot of painful headaches. Trust me on that one. So, if you’re going to pay $5/month to host your website with Bluehost (or whichever hosting company you choose), you might as well claim a free domain name. But, what if you want to change hosting companies? I used to use a web hosting company that offered free domain names, but only for as long as you were their customer. This is totally unethical. Your domain name should be owned by you. If you don’t have full control over it, you’re asking for trouble further down the line. 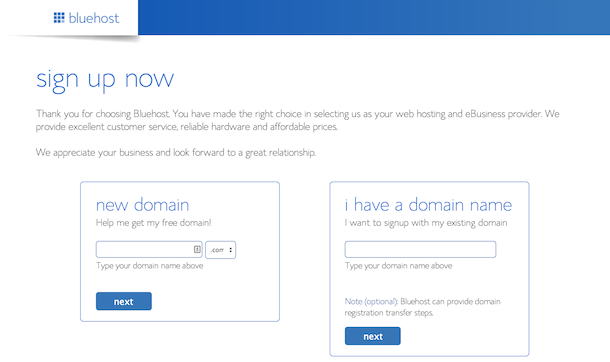 If you want to register a free domain name with Bluehost, you can do so here. The process is really simple and only takes about 60 seconds. If you want to know how to install a WordPress website on Bluehost, we’ve written a step-by-step walk through here. What other ways can I get a free domain name? The method described above is the only way I know of registering a domain name for free without making any compromises. Next, we’ll explore some of the other methods, and why they should be avoided. Free ccTLDs – There are some services that offer free domain names, providing you use a specific TLD (top level domain). The TLD is the bit at the end of your domain name. Venture Harbour’s TLD is .com. These services should be avoided as they typically offer obscure ccTLDs (country code top level domains) like .tk (Tokelau) or .cf (Central African Republic). Not only do these look unprofessional, but they’ll make ranking in Google much harder. Earning your domain as an affiliate – Some domain registrars allow you to earn your domain name by referring other customers. While there’s nothing inherently wrong with this, it’s probably more hassle than it’s worth. Using a free subdomain – Lots of free website builders and services like WordPress.com will provide your with a free subdomain like ‘yourwebsite.wordpress.com’. There are a few reasons why I’d recommend avoiding this. First of all, it means that you do not own your domain name, WordPress (or whoever you build your website with) does. Secondly, it looked unprofessional and is harder for people to remember. Thirdly, you’re limited to using the website builder platform that gives you the subdomain. Often, free website builders are extremely limiting, so this makes growing your website’s audience a huge challenge. Paying for your domain name with adverts – Some hosting and domain registration companies will offer you a free domain name in return for allowing them to place banner ads on your website. Not only does Google frown on this, but what if your website generated a million page views, and you didn’t receive a penny? If you’re going to have adverts, you should be in control of them. I want to keep this post short, as it’s a simple question with a simple answer. If you want a free domain, but don’t want to pay the price further down the line, you’re best off getting one free with your hosting. I highly recommend avoiding any offers that save you $10/year in exchange for relinquishing control over your website. In the long run, it will cost you much more in time, energy, and money. If you know of any other methods of registering a domain without compromising your website, please share them in the comments below. Also, if you have any thoughts on any of the points above, please feel free to share them. Hi there, does Blue Host offer multiple free domains or just one free domain? Blue Host only offers 1 free domain with their hosting plans. Is there any website that offers a domain only for month?